Wow! 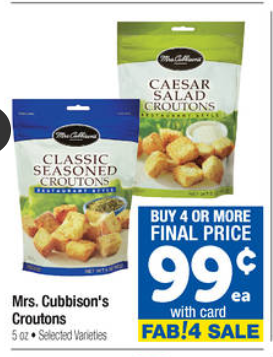 Mrs. Cubbison’s Croutons Just $.49 at Safeway and Albertsons! This is the week to stock up on croutons! We can score Mrs. Cubbison’s Croutons for only $.49 a bag this week when purchased as part of the Buy 4 promo! Don’t forget, the items in this promo can be mixed & matched, so you can buy 2 of one thing, 2 of another, or 4 of one thing, or whatever you want as long as you have 4 or MORE participating items in your transaction (I love that you don’t need to buy in groups of 4, just for or MORE). Be sure to check out the rest of the Buy 4 Promo coupon deals in the Weekly Ad Matchup before you head to the store! Final Price: $.49 each wyb as part of the buy 4 promo! Previous article: Friday ONLY! Kellogg’s Pop-Tarts 12 ct Packages Only $2.00 at Safeway and Albertsons! 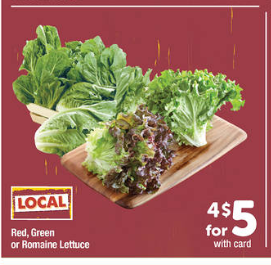 Next article: Safeway and Albertsons NORTHWEST REGION Coupon Deals 8/15 – 8/21 + $5.00 Friday!